Arthur, He does what he pleases…and unfortunately its not that pleasing. Russell Brand can be entertaining, but I don’t think he, or the film, reaches the likability of Dudley Moore in the original. I really could care less about Brand’s interpretation of the character. Jennifer Garner’s expanded character of Susan Johnson becomes a totally manipulative social climber. Nick Nolte as Susan’s father doesn’t have either the charm or the threat that Stephen Elliott brought. And as frequently annoying as Liza Minnelli is, she was way more charming than Greta Gerwig’s Naomi. They didn’t even bother to keep Linda’s original name. I guess that was too boring to keep — as opposed to Susan. Gerwig TRIES to have that biting sarcasm to touche with Hobson that Minnelli does, but its just not there. There is no strength in the character, and when I first heard her speak I winced so hard I pulled an eye muscle. In fact, the only redeeming character is Hobson — now made female in the form of the wonderful Helen Mirren, replacing the equally or more wonderful John Geilgud. Both deliver their lines with so much restraint that the bite is more potent — which is where the comedy grows from. Mirren’s performance makes the film watchable, but she doesn’t have enough screentime to save it. The original story was simple – and in its simplicity was its charm. That story is still in the remake as a seed, but so much crap was layered on top of it, that it was lost. Susan becomes a career climber (as mentioned above). Arthur is arrested and then pays everyone’s bail. Arthur tries to get a job and fails. Arthur rents out Grand Central to impress Naomi. 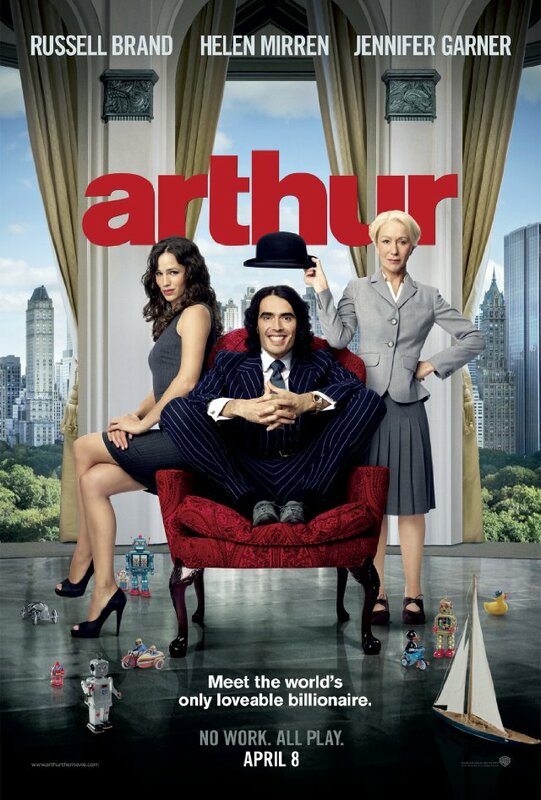 Arthur and Hobson go to an auction where he bids against himself. Susan tries to seduce Arthur at the same time he has a date with Naomi, providing a scene that could have fit in a Three’s Company episode. Naomi wants to write children’s books. Arthur goes to AA. So rather than a concise, cohesive story, is becomes a series of skits — none of which really builds the characters. I don’t think this is a story that needed retelling — but not solely because I like the original. Unbridled alcoholism is viewed a little more seriously in today’s society than 30 years ago (hence the required AA scenes), so the drunken antics of Arthur don’t come across as innocent as Moore’s performance. They are less childlike and more childish — if that makes sense. Furthermore, there isn’t a huge difference between Brand’s Arthur in a drunk state or in a sober state. So — is he drunk all the time? Is he not? Is he drunk on his date with Naomi? — He’s just…. Russell Brand 24/7. And part of this persona is verbally pointing out all the differences between his life and the life of everyone else. “Grand Central Station! What is this place!? Where is everyone going? !” Arthur is rich and drunk… but having us believe that he was raised in total isolation from people and society is taking in a bit too far.